Pierre Kjellberg, Les bronzes du XIXe siècle, Les éditions de l’amateur, Paris, 1996, p. 92. Los Angeles County Museum of Art, The Romantics to Rodin, French Nineteenth-Century Sculpture from North American Collections, exhib. cat., Los Angeles, 1980, pp. 141-143. 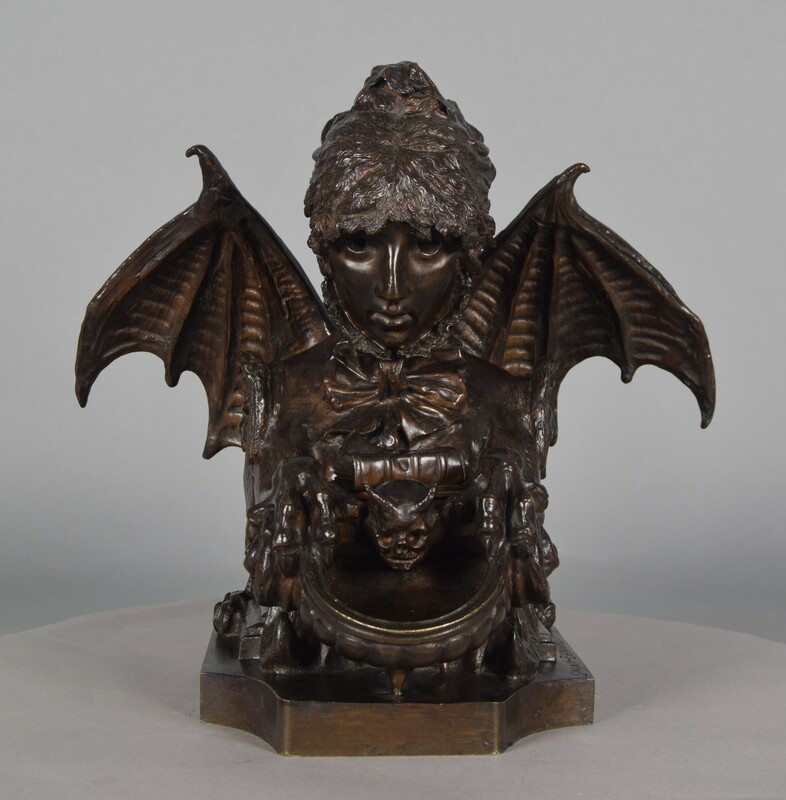 Celebrated as ‘the queen of the pose and the princess of the gesture’ (Edmond Rostand), actress Sarah Bernhardt was also a sculptor, and this bronze inkwell is a self-portrait. Executed in 1879- 1880, Autoportrait en chimère (Self-portrait as a chimera or sphinx) was exhibited that same year in London as part of a monographic retrospective on Sarah Bernhardt under the patronage of the Prince of Wales (33 Piccadilly), and the following year in New York (Union League Club). The Autoportrait en chimère departs drastically from Bernhardt’s more conventional academic or Romantic genre subjects. If there was outside inspiration for this work, one must turn to the Symbolist painters of the day, with whom she had close connections. Sarah Bernhardt can be included in the choir of Symbolism’s muses; whether in the role of the Princess Lointaine (the Distant Princess) or of Gismonda , she popularized the Symbolist aesthetic in much the same way as Georges Clairin, her favorite painter, popularized her image in his academic renderings of high-flown subjects. Gustave Doré and Alfred Stevens both encouraged and helped Sarah. Through them and others, she must have known many Symbolist painters of the period and seen the fantastic motifs such as chimeras, sphinxes, bats, and other animals that often were combined with human form in the works of Moreau, Redon, and similar artists. Autoportrait en chimère is a fascinating and important stylistic document for the last decades of the nineteenth century. Darkness, foreboding, and exotic myth are suggested by the traditional symbols of bat, skull, and sphinx. Woman, as in other fin-de siècle art, is depicted as diabolical, mercurial, and dangerous. Bernhardt characterized herself as part woman, part bat, part griffon, part sphinx in a metamorphosis that recalls jewelry done by René Lalique (Bernhardt was a client of his), as well as works done by many artists in the broadly termed Art Nouveau movement both in France and England. In more conventional terms, she has also evoked her profession as an actress by including the masks of comedy and tragedy epaulettes. The pseudo-Oriental characters engraved on the left side of the base probably allude to her interest in Eastern art, or merely to a fascination with the arcane.